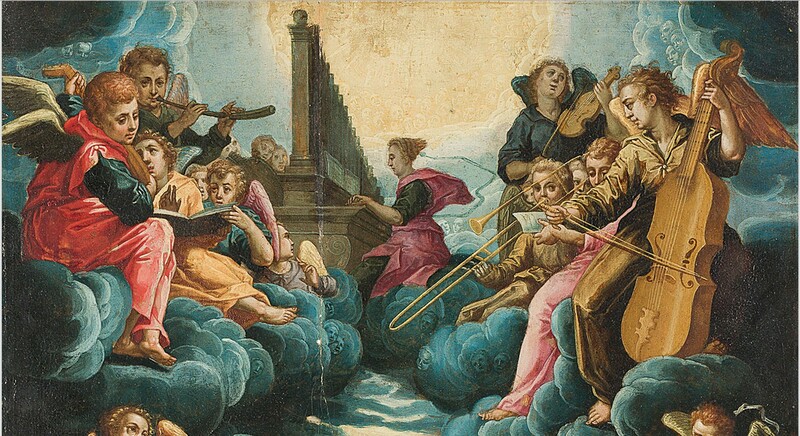 Last week I posted Evolution of a Trombone Painting, which traced a painting through several sketches to fruition in a church fresco. This new post similarly shows several permutations of an image, though in this case, the images span a longer period of time, as they are copied by various artists. They also encompass an impressive range of artistic media, including paper, canvas, stone, silver, wood, and glass. The artist who painted the original image, Pieter de Witte (1548-1628; also known as Pietro Candido), is a Flemish-born artist who was trained in Italy and divided his career between Italy and Germany. 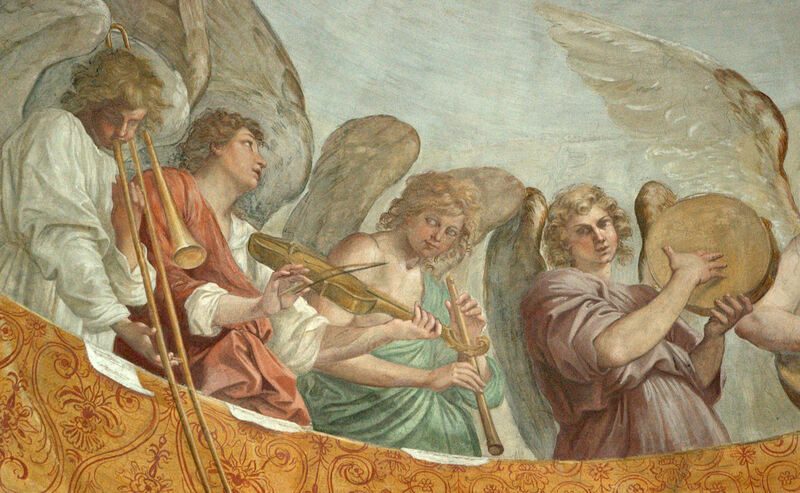 For additional examples of trombone images that were copied by multiple artists, see Young Trombonists in Four Montserrat Paintings. c. 1590—Munich, Germany (? 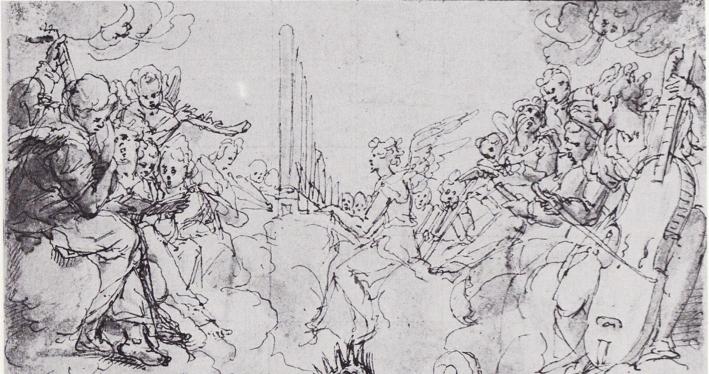 ): A drawing that is probably a preparatory sketch for Pieter de Witte’s David Singing God’s Praise (2nd image below) includes an angel-trombonist that is difficult to see (see below detail; public domain) (Volk-Knüttel 31-33, pl. 101; Vignau-Wilberg 424). c. 1590—A pen and ink drawing attributed to Italian artist Giovanni Battista Paggi (1554-1627) appears to be some sort of preparatory drawing and shows remarkable similarity to the Pieter de Witte image. Because Pieter de Witte was trained in Italy and divided his career between Italy and Germany, an exchange of ideas with the Italian artist seems plausible (see below image; public domain). 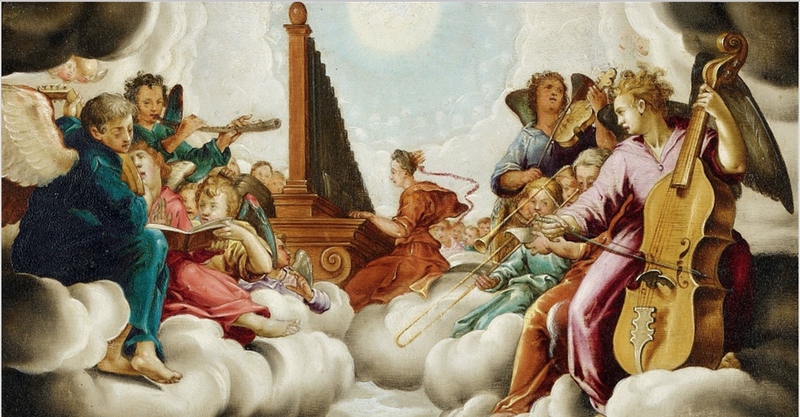 c. 1590—Munich, Germany: Pieter de Witte, court painter in Munich, paints David Singing God’s Praise, which features a trombone among a mixed consort of angel-musicians. 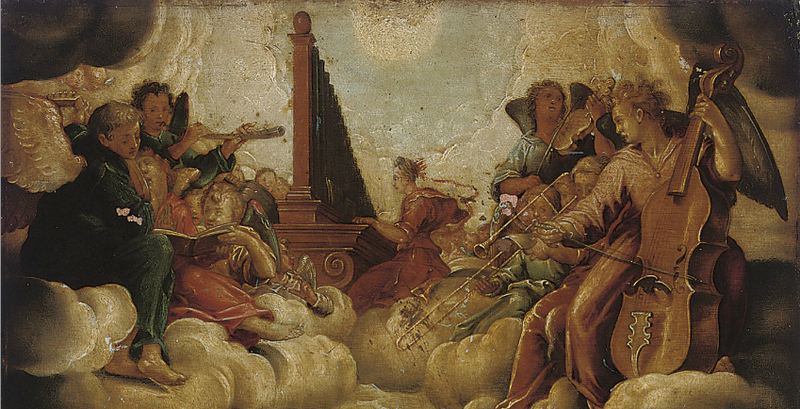 The upper half of the painting, shown below, is meant to depict Saint Cecilia and angels. 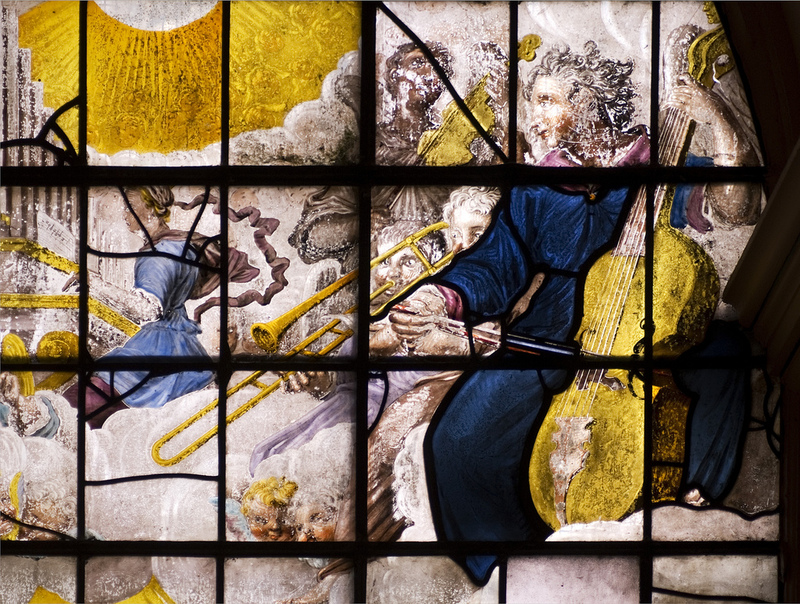 The lower half, not shown, depicts angels performing with David (Haarlem, Frans Hals Museum; Pieter Fischer 22; Bergquist xvii) (public domain image). Click on image to expand. c. 1590—Munich, Germany (? 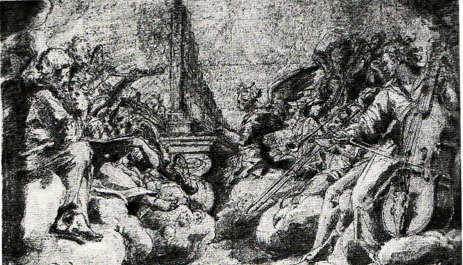 ): A sketch that has the same dimensions as Sadeler’s engraving (2nd image below) is probably a preparatory drawing for that engraving (see detail below; public domain) (Volk-Knüttel 31-33, pl. 101). 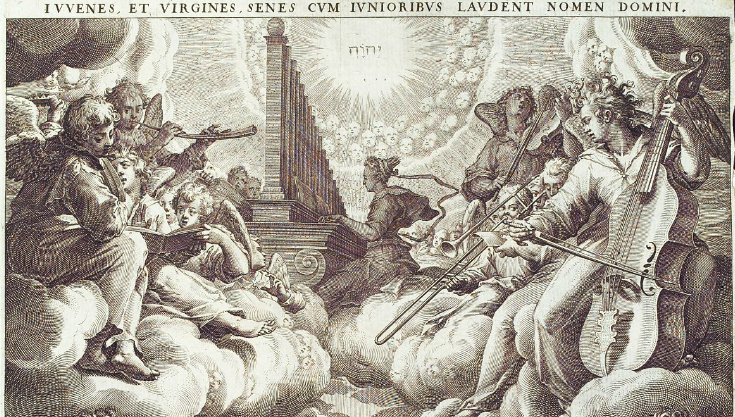 c. 1590—Munich, Germany: Johann Sadeler (Jan Sadeleer), court engraver in Munich, makes an engraving after Pieter de Witte’s painting that accompanies a setting of Psalm 150, Laudent Deum Cithara, by Orlando Lassus. Again, the upper half of the image is shown below (see below image; public domain) (Mirimonde 67; Bergquist xvii). 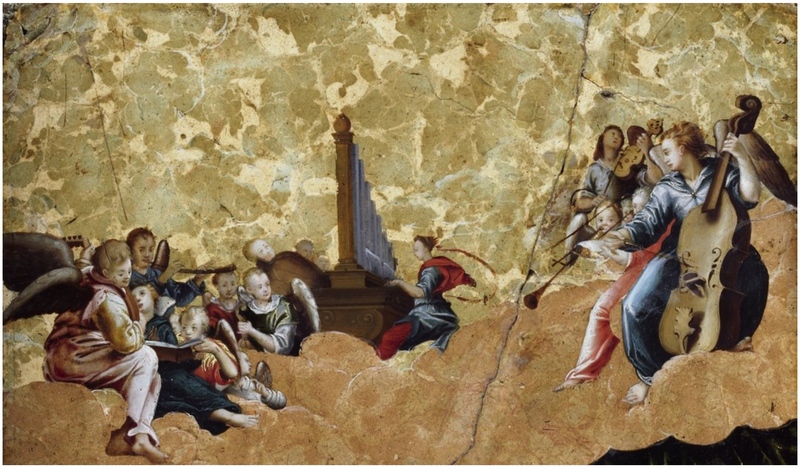 c. 1590—A painting on marble by an unknown Flemish painter appears to follow the St. Cecilia portion (or top half) of the image (see below image; public domain) (Academy of Fine Arts, Vienna). 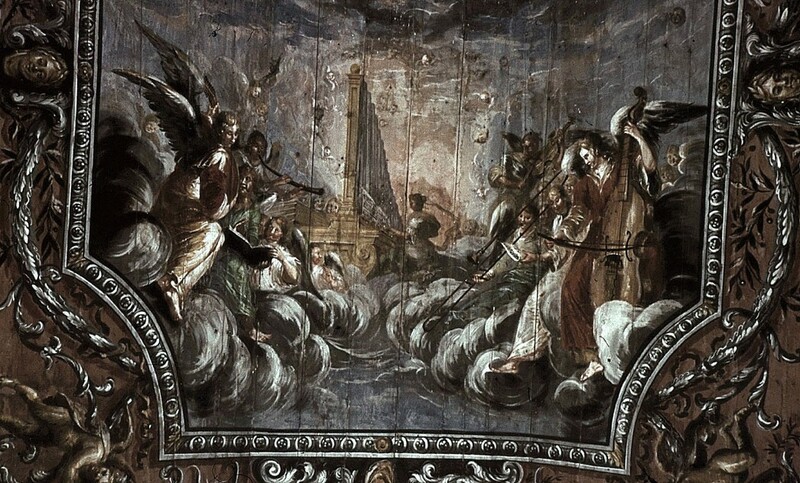 1591-1610—Antwerp, Belgium: The upper half of an altarpiece by Otto Venius in St. Jacob’s Church—the portion of the painting depicting St. Cecilia and angels—appears to either be a copy of or inspiration for the upper half of the painting by Peter de Witte (or one of the other versions). One link between Otto Venius (also known as Otto van Veen and Octavius Vaenius) and Peter de Witte is the time they both spent in Munich in the employ of Willam V of Bavaria (see below image, click to expand; public domain) (source: Belgian Art Links and Tools). c. 1600—A painting attributed to Hans Rottenhammer’s “circle” follows that of Pieter de Witte in close detail. Rottenhammer (1564-1625) himself was born and trained in Munich until 1588 and would have overlapped Pieter de Witte there by a few years (de Witte was employment there by 1586). Rottenhammer also returned to Germany later in his career and would have had more of a “circle” of influence by that time. The upper half of the image is shown below (see below detail; public domain) (wikimedia commons). c. 1600—A painting that may be the same as the Rottenhammer circle painting (above) appears to have a slightly different color scheme but may simply reflect a restoration or different color values in the reproduction. 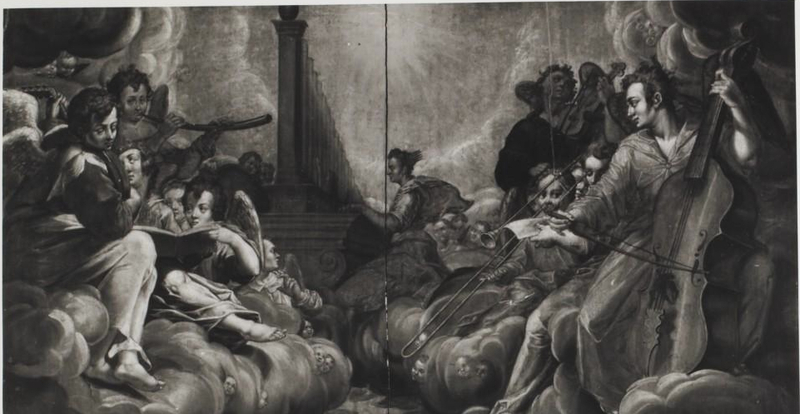 Marketed by the German auction house, Lempertz, as a “copy” after Peter Candid’s (Pieter de Witte’s) original painting, it is held in a private Belgian collection. The top half is shown below (public domain) (Lempertz, Cologne). c. 1600—Antwerp, Belgium (? ): In You, Lord, I Have Hoped, a painting attributed to Flemish painter Maerten de Vos (1532-1603) follows the image closely. The top half is shown below (public domain) (Auktionshaus Peege, Freiburg). c. 1600—Augsburg, Germany (? ): A silver relief by Christoph Lencker (c. 1556-1613) is also modeled after the original Pieter de Witte painting. Again, the upper half of the image is shown below (see below detail; public domain) (Pieter Fischer 23). 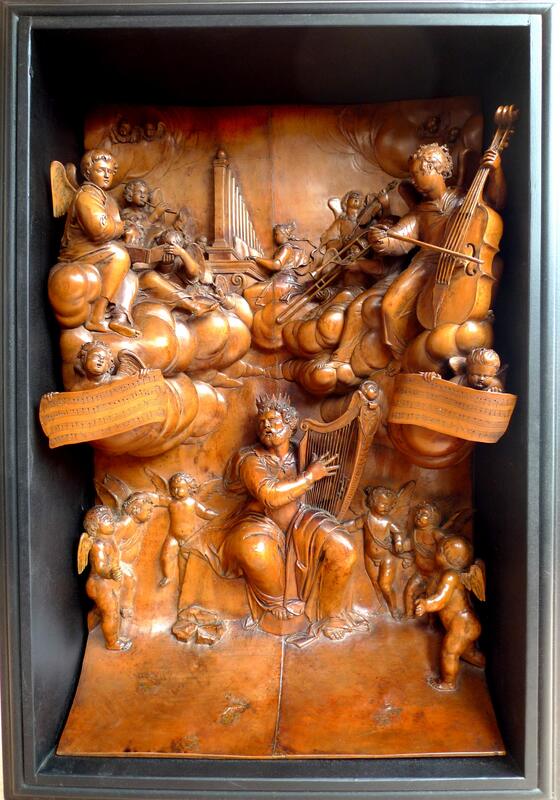 c. 1668—York, England: Celebrated sculptor and wood carver Grinling Gibbons (1648-1721) follows the image closely in his boxwood carving, possibly created to adorn an organ case in a church (see below image; public domain). Special thanks to Chris Wells, who in 2017 restored the carving, including the trombone, which had been missing for some time (pers. comm., Feb 2017). 1693-98—Gwardeiskoje, Russia (then Mühlhausen, Prussia): A painting by Gottfried Hintz (or Hinz) on the ceiling of the Kirche von Mühlhausen, an evangelical parish church, follows closely the top half of Pieter de Witte’s David Singing God’s Praise (c. 1590) (see below image; public domain). I might have some small additions to your post. Thank you! I will work these into the post! Great article. I work at Fairfax House in York who have recently secured the purchase of the panel by Grinling Gibbons. Would it be possible to drop you an email? It would be super to pick your brains if you don’t mind? Thank you. Yes, of course. Happy to help if I can. I sent you an email to the address listed on your post/comment. That sculpture is a knockout. Also interesting to compare the treatment of the gamba (?) across the various versions. The cornetto situation in the wood carving is also interesting. If you compare it to the others, it looks like it may have broken off partially. The man who restored the carving told me he had to make an entire new trombone (and I do have an earlier photo showing the trombone missing); he says he used this post to help reconstruct one! 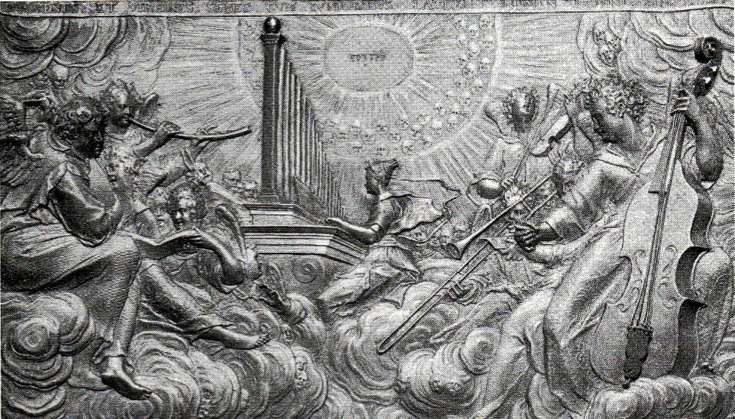 Is that “David” with the crown and harp? There seems to be a bit of a proportion problem with his thighs. Yes, definitely David. He’s in many of the others in the post, I just showed details of the top half, since that’s where most of the musicians are. Not sure what the story is with his thighs!